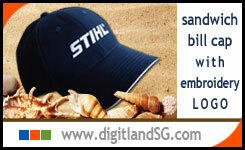 DigitLand specialise in manufacturing customise cap withPrinting or Embroidery of your require design. 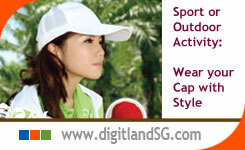 We also carry Ready Stock Caps in different styles and color varity to choose for your corporate identity. To order customise CAP design and printing?. Please Click See detail for samples and more infomation. 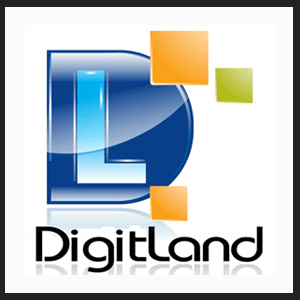 DigitLand supply Ready Stock: 6 panel Sandwich Bill Caps in different colours. available both cotton and dri-fit material. We also specialise in Custom made: Sandwich Bill caps, if your order Qty is more than 300 pcs. Talk to us.. See for more infomation. 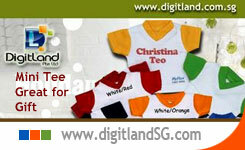 Mini Tee : Micro Tee with hanger & suction cap, Unique Items for delivering your Logo with service messages. Perfect for Event, Product Show, D&D door gift. Customise Logo or Name Printing available as in Optional Request. To order like this, please click for more details.